Gallipolis Police Officer Mark Still addresses the Southeastern Ohio NAACP tribute to Martin Luther King, Jr., Monday. GALLIPOLIS — In partnership with RVSP of Ohio Valley, the University of Rio Grande, the Rio Grande Community College and the Southeastern Ohio Branch of the NAACP, Gallipolis Police Patrolman Mark Still presented his thoughts on the importance of Martin Luther King, Jr., Day in Paint Creek Regular Missionary Baptist Church, Monday. Elma Johnson served as the mistress of ceremonies while Rev. Calvin Minnis, of Corinth Missionary Baptist Church, led the benediction. A welcoming message was given by URG President Dr. Michelle Johnston, NAACP First Vice-President Kyle Gilliland and an introduction of area dignitaries given by Martha Cosby. Gallipolis Police Chief Jeff Boyer was asked to introduce Still after a reading of a proclamation by Gallipolis City Commissioner Mike Fulks. Still was awarded the Officer of the Year award by Boyer in 2016. Officers of the Year are elected by colleague officers. Still for that year led fellow officers in arrests and received the city’s life-saving award for responding to a structure fire with fellow officers that March. Boyer said that Still went into the structure, found the victim in the smoky building and drug her to the front door of the residence before being assisted by fellow officers to help save the woman’s life. Still is a 10-year law enforcement veteran. 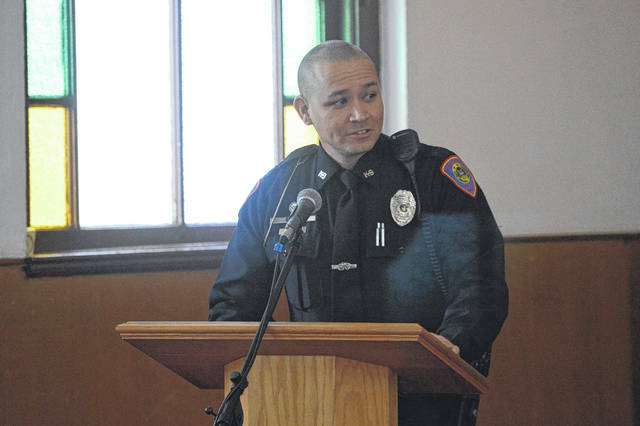 In his current position as a patrolman with the Gallipolis Police Department, he serves as the Gallipolis Police Department’s K-9 handler, a member of the special response team, and is a member of the police department’s honor guard. In addition, he serves on the Buckeye Hills Criminal Justice Advisory Board and is the Commander for the Gallipolis Law Enforcement Explorer program. Still stressed that had King not been alive, he may not have been able to stand before the congregation in his uniform. Still discussed civil rights laws passed which deterred Americans from being discriminated against for their backgrounds and heritage due in large part to protesters’ actions. “If in my lifetime, if I’ve only influenced one person that it doesn’t matter what their current situation is. (He hopes to have influenced that person to) dream big, set your goals and work hard until those dreams are your reality, even when you’re told no…Never give up,” said Still. Susan Rogers, director of RSVP of Ohio Valley, announced MLK Jr. Day Essay Contest winners. NAACP Branch President Mabel Tanner offered closing words for the ceremony and the benediction was led by Rev. Harreld Scott, pastor of Paint Creek Regular Missionary Baptist Church.